You may have noticed, I haven’t been logging a whole lot of running miles. For someone who has pretty much run all of her life, this down time has been something of a mixed bag. While, at first, I enjoyed the freedom to do what ever sort of run (or not) I felt like on any given day — no pressure to stick to a training schedule — I have now found that my body has become too accustomed to not running at all. It’s not so much the physical activity per se — or is it? Earlier in the month, I found my great toes were getting ripped raw to the point that I would be left hobbling about after each of my runs. It took me a while to identify the issue. 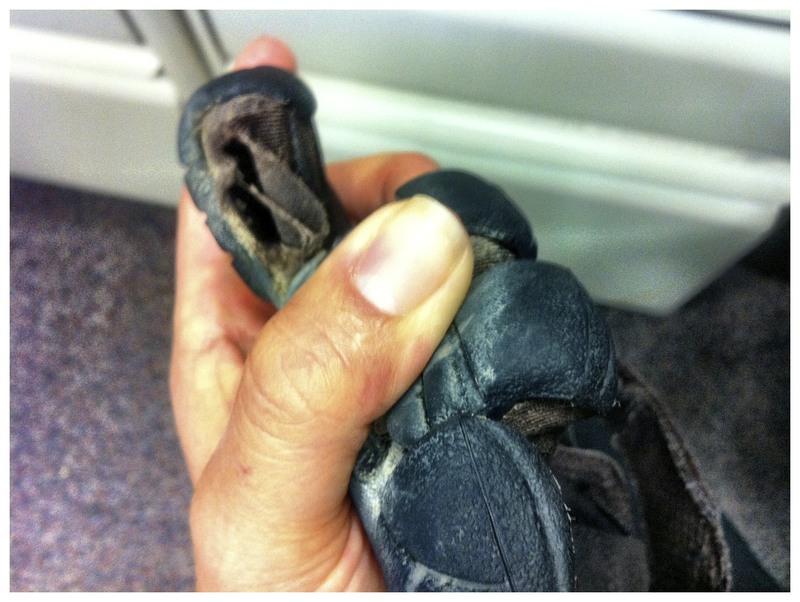 When I did, it took me even longer to locate a new pair of my favorite running footwear (in my size). My running was further set back by the breaking in period. Believe it or not, it had been so long since I had broken in a pair of VFFs, I forgot about how the fresh seams rip up my precious feet. I spent another 2 weeks sidelined as the blisters healed up enough for me to head out again. When I did, it was exhilarating! However, my body reacted with back soreness which trickled into my other activities. The thing is, I want to run. Correction: I need to run. Aside from now being registered for my first event of 2012, running is the activity that clears my head the best. Better than a seated meditation, running is the activity that helps me find separation from the things that stress me out. Now, if only I can transition back into a more routine level of running without struggling with the woes that hold me back. By the time I let myself entertain the notion that the back pain I’d intermittently been experiencing was more than just an ill-fitting bicycle my mind leaped from strained muscles straight to late-stage cancer. Deep down, I knew it couldn’t possibly be the later and still I let myself entertain the what if? I even asked The Man if he would remain in contact with YaYa if I was to die. Reality kicked back in by the time I was face to face with my physician. Her exam confirmed observations which I and my fellow yogis have noted over the past many months. My back is not quite the straight and narrow that you’d come to expect; it is crooked. The question is: Why?